Occupy Santa Cruz (OSC) activists have held their post at the courthouse steps for nearly 25 days now. They have several tables lined with occupation literature and are easily visible to anyone traveling down Water Street. Their ideals resonate with most people who pass by and throughout the day drivers will shout and honk in support. 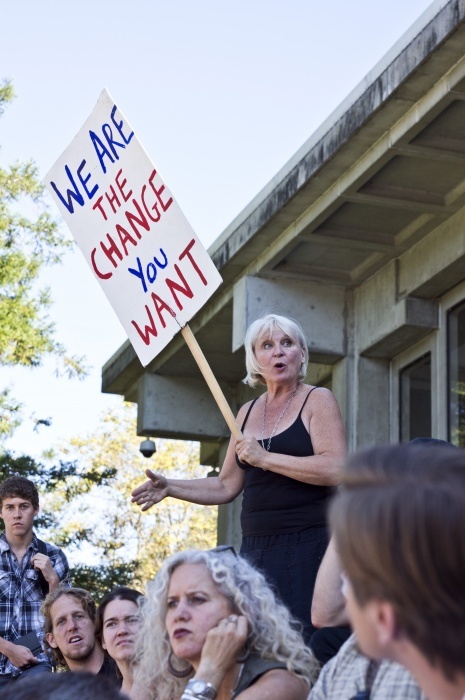 It is also common to see pedestrians interrupt their walks to curiously approach the site where they engage in dialogue with occupiers, which sometimes results in them holding up a sign and helping out. Open to new members as well as old, OSC holds daily general assemblies to discuss strategies, progress and to address the concerns of members and citizens. 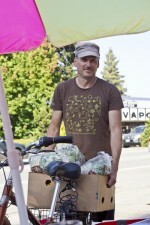 At these meetings, people take turns discussing issues and produce solutions that are voted on and recorded. Not only do they listen to each other, but they regulate themselves as well. If a member of the group disrupts a meeting or acts inappropriately, members will band together to approach that person nonviolently and either convince them to stop or make them leave. Self-regulation does not ease tensions with the police, though. Officers occasionally come by with digital cameras to monitor the occupation and have made threats of raiding the camp for drugs and other illegal items. 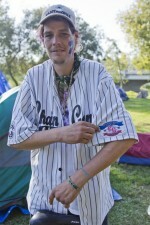 Occupy sites in Oakland, San Francisco and San Jose have already been subject to raids, leading to many arrests. 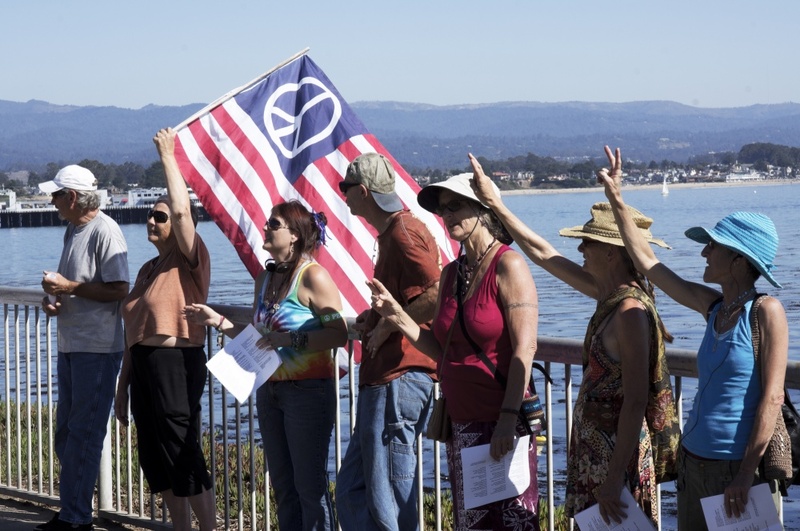 It seems that a raid in Santa Cruz is imminent, but the OSC members are aware of mounting governmental pressure and have discussed plans of action in the case of a raid. As time passes, the movement only grows stronger; eventually the 1 percent will be forced to confront everyone else. 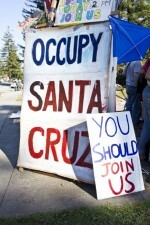 Occupy Santa Cruz ended its second full week of protesting with three events over the weekend. The events drew hundreds of community members in support of the Occupy Wall Street movement which is sweeping the nation and capturing the attention of average Americans, politicians and political pundits alike. On Friday, at least 100 people congregated at the Water Street entrance to the courthouse, where the movie “V for Vendetta” was screened. Along the concrete stairs leading up to an ad-hoc movie screen sat protesters and community members who came out for some free entertainment. 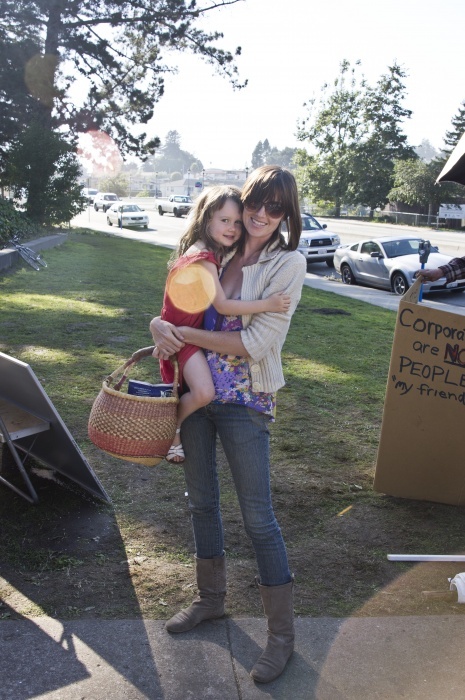 On Saturday, Occupy SC maintained camp in San Lorenzo Park, and participants spoke and tabled at WAMMFest. 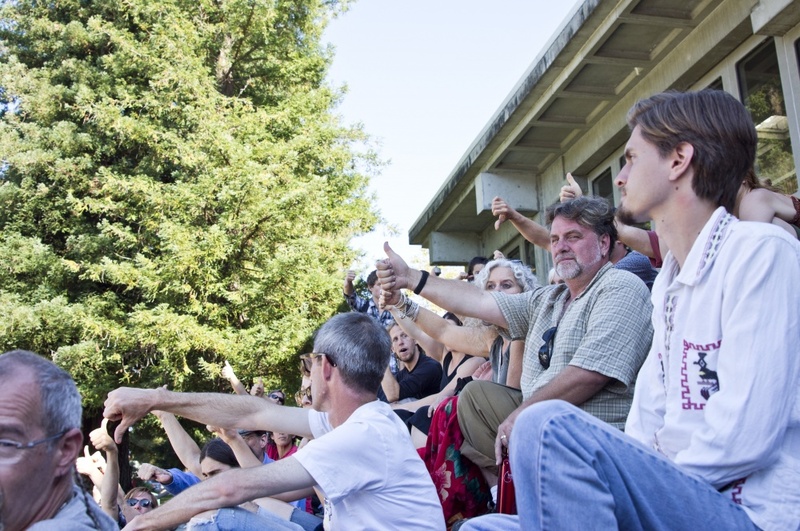 Occupy SC ended the weekend with a human chain around the Mark Abbott Memorial Lighthouse on West Cliff Drive, home of the Santa Cruz Surfing Museum. Local media estimated 150 people participated in the demonstration. 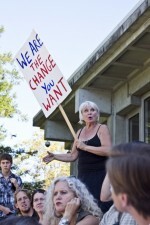 Mary B., a surfing museum attendant who prefers to remain anonymous, showed up to work just after the protest started. The protest, which was originally scheduled to go from 11:30 a.m. to 3 p.m., was over before 2 p.m. One participant said she felt there was not a lot of energy, which was why people left the demonstration early. 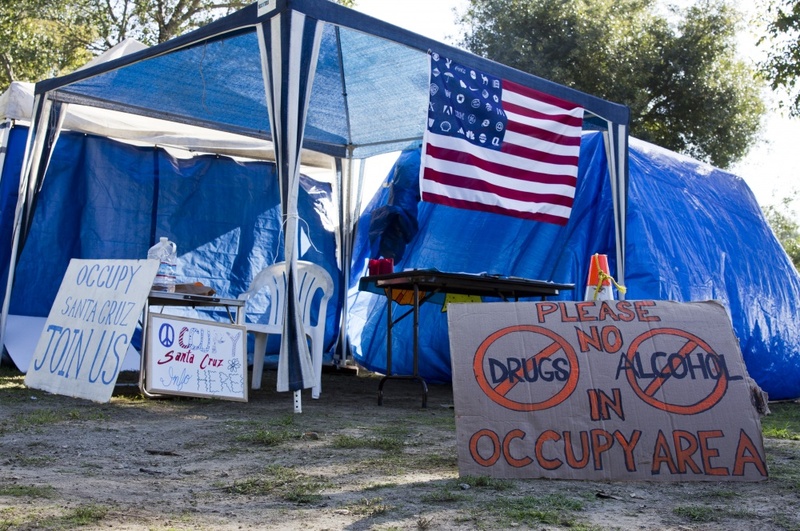 Police, who often check in with the Occupy Santa Cruz protesters at their base-camp in San Lorenzo Park, were not present at Sunday’s demonstration. 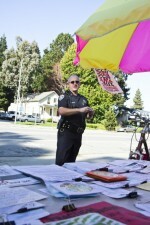 Santa Cruz Police Department spokesman Zach Friend said the department was aware of this past weekend’s events, but no formal coordination between protesters and the police department took place. 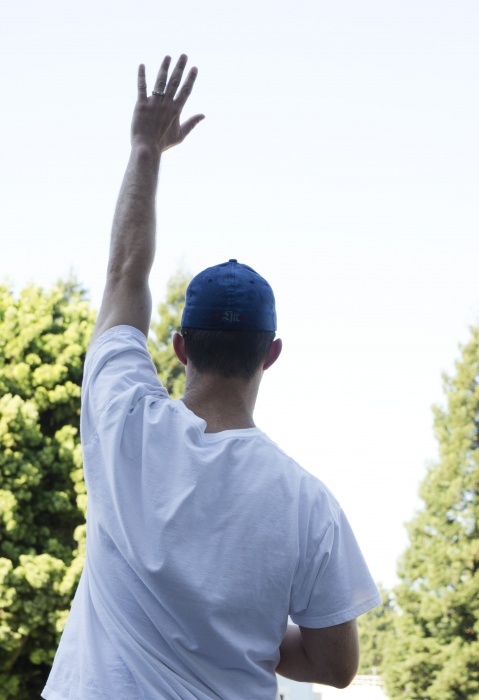 Many police departments across the U.S. have taken action against protesters in the “Occupy” movement. On Monday, the San Francisco Chronicle reported that 130 protesters were arrested in Chicago, 11 in Cincinnati, and more than a dozen in Philadelphia. 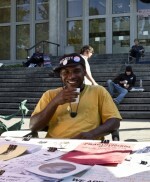 More than 100 protesters participating in Occupy Oakland were arrested on Tuesday, according to The Los Angeles Times. 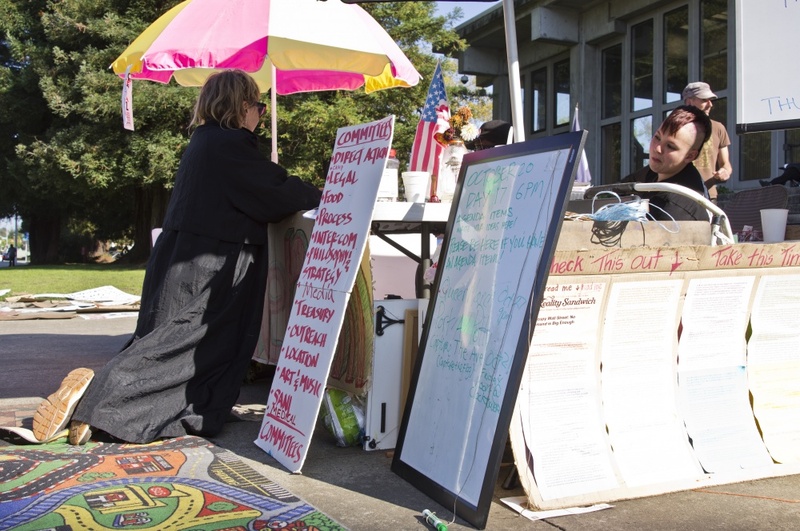 Despite community support for Occupy Santa Cruz, tension has been brewing between protesters and the police department, which warned protesters last week it will issue citations if the protesters do not accommodate other parties who want to use the park. Local elected officials like Mayor Ryan Coonerty and Rep. Sam Farr (D-Carmel), sympathize with the protesters. Occupy Santa Cruz protesters have led several marches around town to protest in front of the national banks, which have been primary targets in demonstrations for the broader “Occupy” movement. On Nov. 5, protestors are calling for a national Bank Transfer Day. 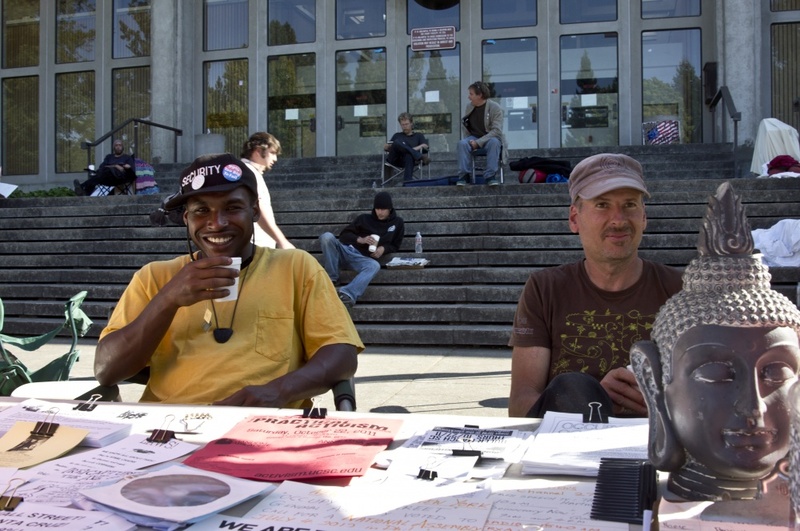 The idea of transferring money from national corporate banks to community banks and credit unions is popular among the “Occupy” movement’s protesters. 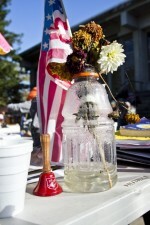 Local congressman Farr, who is “very supportive” of the protesters and a member of the Progressive Caucus, donated cash two weeks ago when members of the caucus passed around a hat on the floor of Congress to collect money for the Occupy protesters in Lafayette Square, a park located directly north of the White House. 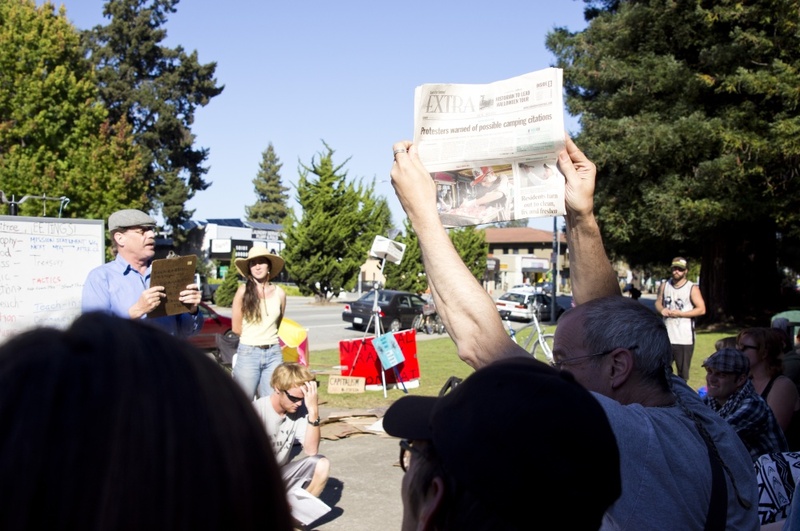 At a press conference the Congressman commented on creating green jobs in Santa Cruz and the “Occupy” movement. As Republicans continue to block the president’s job bills, the latest unemployment figures remain high in California at a whopping 11.4 percent, and 10.1 percent in Santa Cruz County. Farr suggests students get internships at places they want to work so they get a job when the economy begins to pick up again. 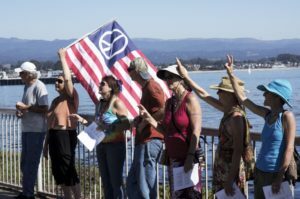 Dozens of demonstrators took part in a march Saturday from the County Courthouse steps on Water Street, down Ocean Street to Soquel Avenue and then to Pacific Avenue as part of the Occupy Santa Cruz movement. 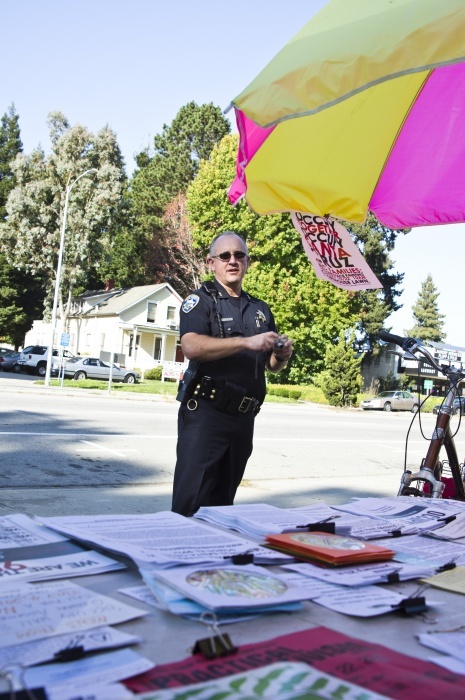 Members of the Santa Cruz Police Department followed the group along Saturday afternoon on motorcycles and in cars to ensure no one was hit by a car and to help with controlling traffic. At one point, the crowd had blocked much of Water Street. No citations or tickets had been issued to demonstrators Saturday as of about 6 p.m. 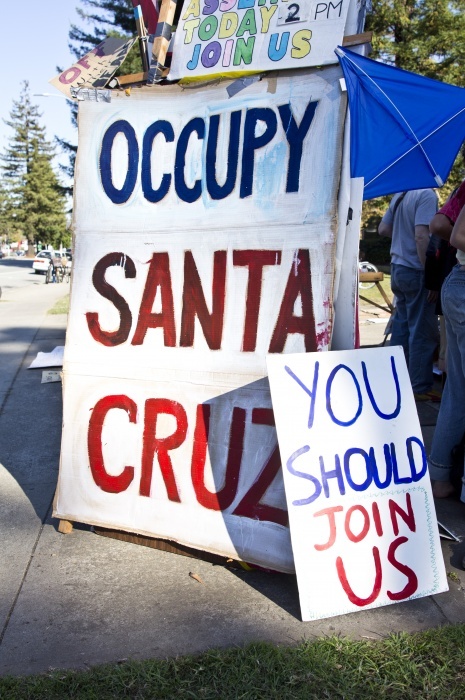 Occupy Santa Cruz has been holding public demonstrations since Oct. 6 in San Lorenzo Park and at the courthouse steps. The demonstrations are part of events occurring nationally to protest a litany of problems, primarily focusing on the economy and corporate greed. SAN FRANCISCO — San Francisco police and public works crews dismantled a Financial District encampment early Thursday that had been occupied for nearly a week by activists protesting economic inequality. Protesters with the group Occupy SF said about 80 officers wearing riot helmets confronted 200 campers and their supporters at about 12:45 a.m. The officers guarded city workers who removed tents, lean-tos, sleeping bags and other belongings from outside the Federal Reserve Bank building at 101 Market St. near Main Street. One protester was arrested for allegedly assaulting an officer. Police said that only one squad of fewer than 20 officers had been on the scene to help public works crews remove nine truckloads of tents, wood pallets and trash. 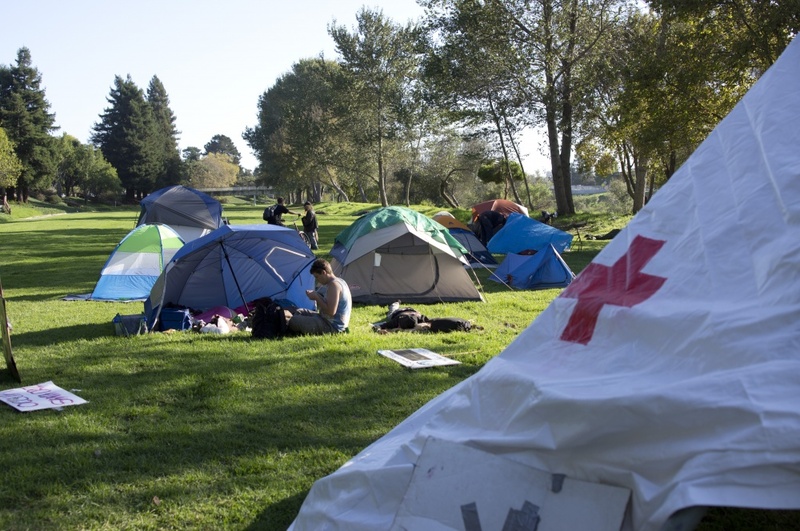 The camp was taken down hours after several hundred people marched through the Financial District in an Occupy SF-organized protest. 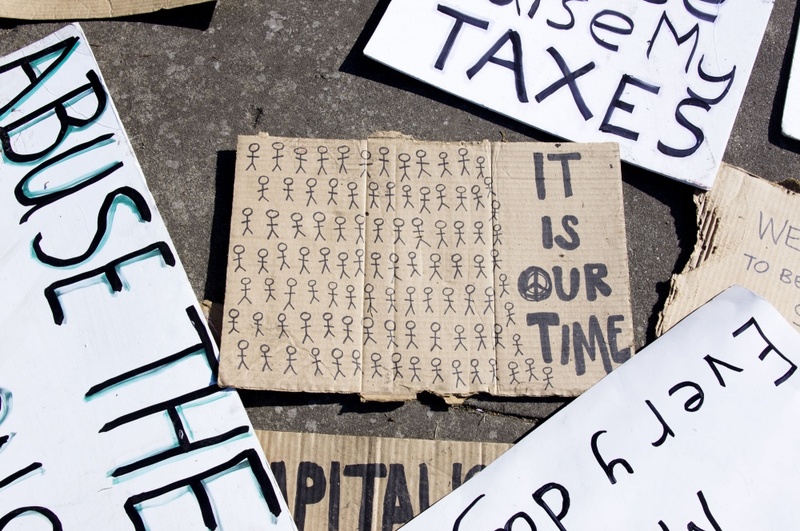 The group formed in solidarity with the Occupy Wall Street movement, which has been staging protests in New York over what it calls corporate greed and the excessive concentration of wealth and power among 1 percent of the nation’s population. 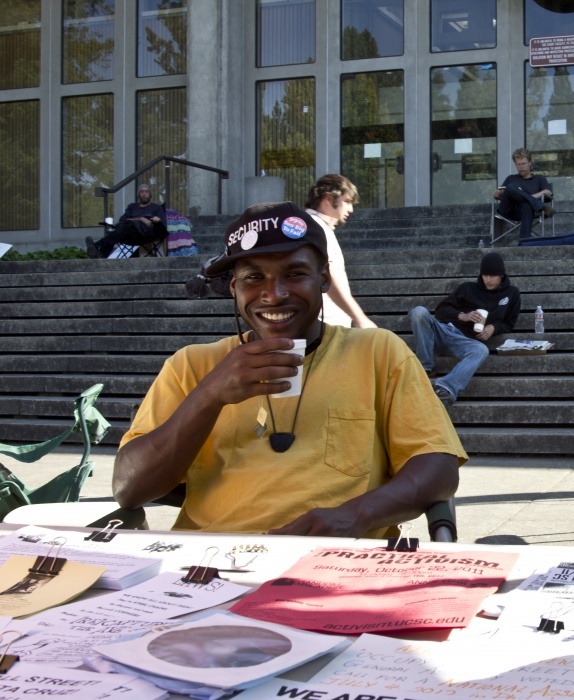 The Occupy SF camp formed outside the Federal Reserve Bank a week ago Thursday. By Wednesday it had grown to about 50 people. At around 9:30 p.m. Wednesday, police handed a notice to Occupy SF protesters that although the city and Police Department “celebrate and protect” free speech and the right to assemble, their encampment violated several city laws. 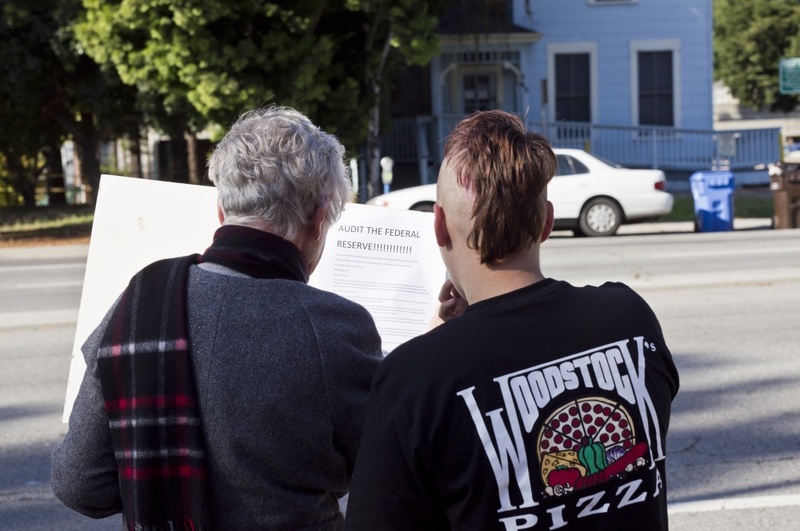 They included a ban on having an open flame on a street or sidewalk, creating a public nuisance, disorderly conduct in lodging and serving food without a permit. Protesters began taking down tents and removing belongings, activists said Thursday, but also posted the police notice online. More than 100 supporters subsequently arrived at the encampment. At 12:45 a.m., Department of Public Works employees arrived in trucks and began removing campers’ possessions as police stood guard. About 50 protesters stood in front of one truck to try to prevent it from leaving, activists said. The trucks took an alternate route and drove away on Main Street. Police arrested Kevin Hernandez, 26, for allegedly punching and threatening an officer and resisting arrest, said Officer Albie Esparza, a department spokesman. 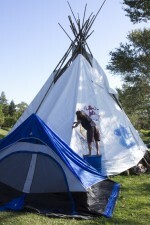 Several protesters said the officers had used excessive force in removing the camp. Esparza said he had received no complaints of excessive force. He said police had broken up the camp not to damage the movement, but because it was posing a public safety risk. Activists said they tried moving on to Justin Herman Plaza on Thursday, but that police told them they could not. They said they would return to the Federal Reserve Bank to spend the night in sleeping bags. Police fenced off the entrance of the building and stood guard. Mayor Ed Lee issued a statement saying he would work with police to safeguard protesters’ free speech rights while also keeping sidewalks and streets clear. Supervisor John Avalos said he was at the camp Wednesday night after police served notice, but left shortly before city crews moved in. Sunday 3-24-19 9:30 AM-3 PM at www.freakradio.org Bathrobespierre’s Broadsides: Flashback Free! Interview Packed! Endless Agony with the S.C. City Council Ross Camp Fightback And More!